From Central Mumbai: 99 kms. From Navi Mumbai (Vashi) : 74kms. From Chhatrapati Shivaji International Airport: 92 kms. 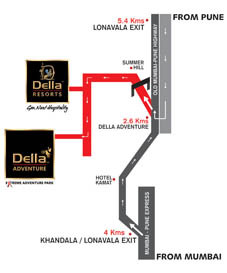 4 kms from Khandala Expressway Exit & 2.6 kms from Main road (Old Mumbai-Pune Highway).